The Times Newspaper in the UK won this year’s creative data award at Cannes Lions by using historical data to bring to life the speech President Kennedy was never able deliver in Dallas 1963. The Times was seen as a paper with a narrow mindset. This wasn’t actually true as the The Times prides itself on having many differing opinions and voices on any particular story. The newspaper wanted to reposition itself as a publication that represents many differing voices. As a result it launched a ‘Find your voice campaign’ to its readers and potential readers around the world. In 1963 nobody got to hear President Kennedy’s hugely important Trade Mart Speech. In 2018, data enhanced creative technology brought his Unsilenced speech to the attention of over 1 billion people. The paper spent months researching and collecting every single piece of Kennedy audio available. In the end they used 831 speeches in the process. Combinations of sounds are selected and smoothed together by months of painstaking sound engineering. 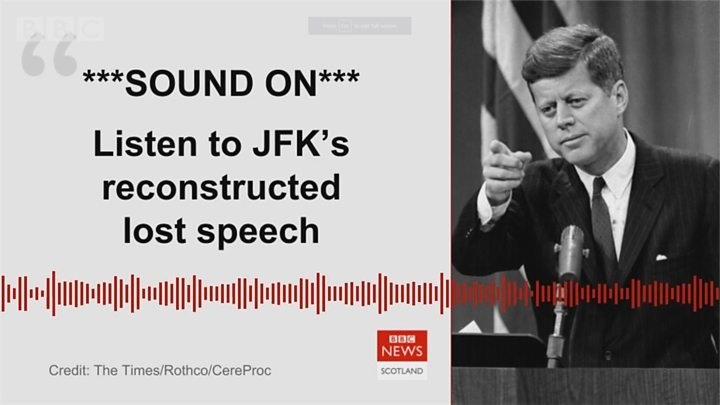 The resulting piece of audio was a world first, an AI audio speech made completely out of data from hundreds of old speeches of varying quality and audio. The breakthrough technique involves smart splicing small phonetic fragments of speech - typically around 250,000 individual segments, down to 3milliseconds in duration. •	Data enhanced consumer experience - Readers could finally hear The Trade Mart speech 55 years after President Kennedy’s death. •	Business impact - Over 1 billion media impressions & every one of our rivals covered the story. The campaign won the Creative Data Lions for 2018. The award celebrates the interplay of ideas and information - demonstrating how the execution of a campaign was enhanced or driven by the creative use, interpretation, analysis or application of data.